Your Progressive Ruin 1981-2 Comics Investment Guide. 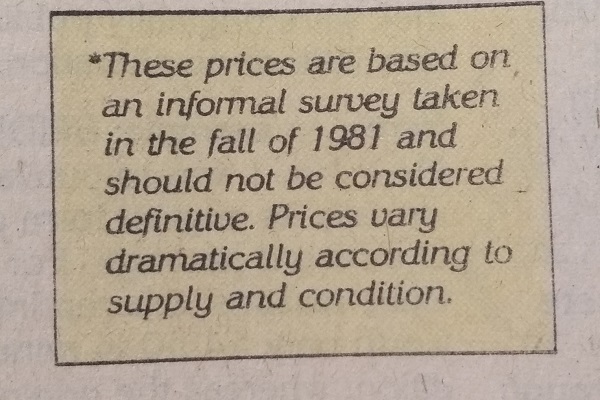 …and unfortunately I don’t have a 1981/1982 price guide in front of me to compare prices, but let’s see what Marvel was pushing as “collectible” and how things compare to the modern marketplace. While the collector’s guide is at least somewhat evenhanded in its dealing with other comic companies (it at least mentions they exist, even if it sort of downplays their importance in comparison to Marvel’s), it’s probably not surprising that only one DC title makes it to the chart. In fairness, there probably wasn’t a lot to choose from at the time that was still relatively obtainable and at least partially in demand. I mean, Metamorpho #1 was probably not too pricey at the time, but probably wasn’t burning up the back issue bins in the early ’80s. House of Secrets #92, perhaps, as a Swamp Thing movie was on the way and surely the huge success of that film would jumpstart demand for this decade-old book. On the other hand, New Teen Titans #1 was likely only listed because they could hardly ignore it, being one of the real hot books of the period. They probably would have happily used that spot for, I don’t know, Dazzler or something. Anyway, #1 – Daredevli #158: Frank Miller begins his run on the title, and currently guides at $160 in NM. Still an in-demand item…all the Miller Daredevil s still move very well for me. A good investment pick, Marvel Comics Guide to Collecting Comics writer! #2 – Peter Parker [The Spectacular Spider-Man #27: haven’t had one of these in a while, but I remember it being a good seller at the old shop, though the guide price did seem to outstrip demand. This is another result of the “Frank Miller on Daredevil” mania that was going on at the time, as this issue featured Miller’s first work on ol’ Hornhead. $85 in NM now, though I wonder if it has the same level of demand as Miller’s owrk in DD. #3 – [Incredible] Hulk #181: nope, can’t say I’ve heard of it. Okay, fine, the first full-length story (and over appearance) of our favorite Canucklehead, Wolverine, which tends to go for bonkers prices. $4200 in NM, $4199.95 if it’s missing the Marvel Value Stamp. I could be a bit off on that second price. Anyway, that’s just the guide price…it’s all over the map online, and by “all over the map” I mean “still more money than most of us reading this would be willing to spend.” I’ve sold trashed copies of this for hundreds of dollars. Demand is over the top for it still. #4 – X-Men #129: took me a second to remember what’s special about this specific issue of X-Men , aside from being in the middle of the classic run by Chris Claremont and John Byrne…a run still in heavy demand today. A quick check rmeinds me it’s the first appearance of Kitty Pryde, which is absolutely a significant event in the history of the series, the introduction of one of the now-quintessential members of the team. Hope she survives the experience! $160 in the guides now. #5 – [New] Teen Titans #1: assuming they mean the comic by Marv ‘n’ George, of course. Still sells great. Guides for $70, which seems lowish…but the Marvel Comics Guide to Collecting Comics should have pushed the second issue, with the first appearance of Deathstroke the Terminator, as that now guides for $175. Hokey smokes. #6 – Iron Man #115: boy, I had to look this one up. And it’s not even separated out from the issues around it in the current guide…numbers 101 through 117 are all lumped together, priced at $12 in NM each. 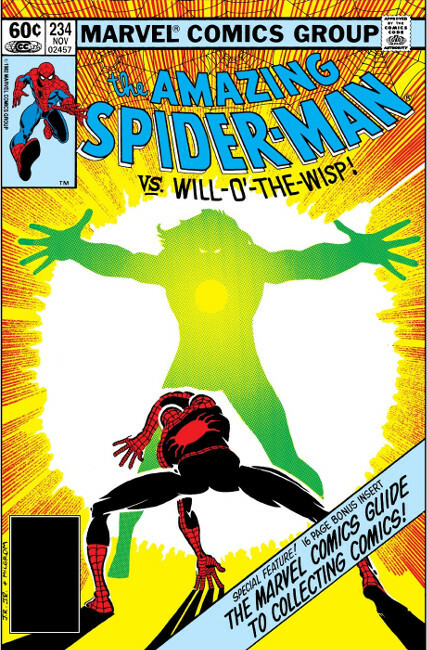 The issue in question features John Romita Jr.’s first art on the title. Oh, and an Avengers appearance. …The Marvel COmics Guide to Collecting Comics should have plugged Iron Man #55, the first appearance of Thanos, a comic I get asked for nearly every day. For reference, that one guides for a mindboggling $1500. #7 – Micronauts #1: $18 in NM now, but I don’t know if there’s a lot of demand for this right now. I mean, at this point in the list we’re into the stuff that will of course sell in higher conditions, as certain collectors are now looking for copies of Bronze Age books and will buy stuff like this because it’s it excellent condition, not because of any particular interest in Micronauts or whatever. By the way, I still don’t like the term “Bronze Age” — I mean, yes, “Golden Age” and “Silver Age” were marketing terms, too (“A Golden Age Classic” sounds better than “Here’s a reprint of some old comic we don’t have to pay anybody for”), but “Bronze Age” feels even more blatantly so. But perhaps I digress. #8 – Rom #1: I was all ready to poke a tiny bit of fun at this, but the current guide has it at $75, amazingly! Guess I haven’t looked it up in a while. But this was a comic that had a fan following at the time, and still has some interest nowadays. Though, as folks found out, that interest of “nostaglia for Rom in the Marvel Universe” doesn’t necessarily translate to “sales on a new Rom comic that is separate from the Marvel Universe,” but What Can You Do? #9 – Moon Knight #1: two words, please note. Moon Knight was a semi-hot character for a while, especially the issues that featured early work by Bill Sienkiewicz. Not a whole lot of demand now that I’ve noticed, though there’s an occasional blip in character awareness (such as the recent short run by Warren Ellis and Declan Shalvey). And that series that began in ’89 ran 60 issues was in quite a bit of demand both early on and, due to some artist-driven collectibilty, near the end of the run. But this series, from 1980…$40 in NM in the current guide. Like I noted with Rom , primarily in demand by folks looking for “key” Marvels of the period, rather than out of Moon Knight fandom. But I know Moon Knight fans are out there, don’t get me wrong! Don’t write in to complain! #10 – Ka-Zar #1: hoo boy. So, not, like, Amazing Spider-Man #129, or Marvel Spotlight #5, but Ka-Zar . Look, not casting aspersions on the former pulp magazine character that’s legally nothing like Tarzan, but was Ka-Zar ever a “hot” character? I mean, he must have been at least of some interest, with multiple series over the years, but I don’t recall there being a lot of fan demand. Maybe I’m just not remembering. And I don’t know which series of Ka-Zar they’re even talking about here. 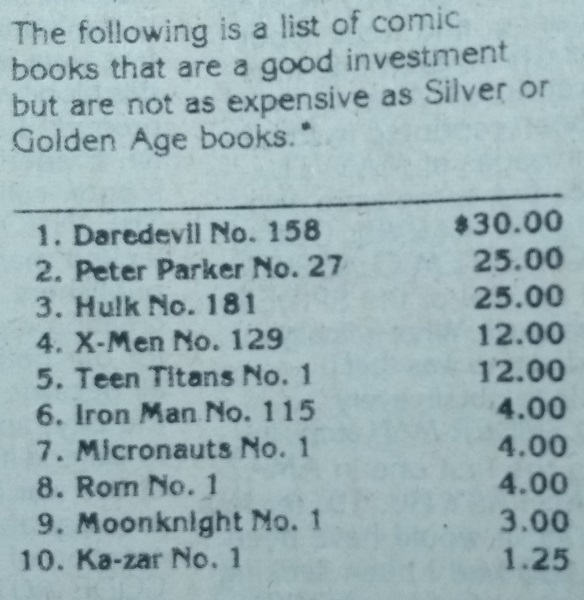 I’m assuming it’s the 1981 series that had launched around the time of this Marvel Comics Guide to Collecting Comics (which now guides for $5), but there’s the 1970 series (#1 – $65) and the 1974 run (#1 – $28), both of which would have surely been more than $1.25 at the time. So there you go…once you get your hands on that time machine that every comic book collector wishes s/he could have, you can go back properly informed as to which funnybooks you need to buy to make your fortune. Because surely that’s the wisest use of a time machine. Sorry JFK, too bad passengers on the Titanic, we need to get multiple copies of Rom #1 to seal in plastic slabs. Guide prices I list above of course don’t necessarily reflect whatever shenanigans folks get up to on auction sites, or price bumps due to the aforementioned slabs, or whatnot. But that should give you an idea, anyway, of a specific era in time where even the big comic companies couldn’t ignore a burgeoning interest in comics collectibility. I wonder if Marvel’s motives in adding Ka-Zar at the bottom was to goose reader interest in that non-returnable DM-only series, by comparing it to its companion series in the same format, Micronauts and Moon Knight. I’d only been “collecting” comics for less than a year, buying them at a local bookstore that just carried DC and Marvel and “storing” them in stacks in a paper bag in my closet, when this issue of ASM came out. It was my introduction to the idea that not only should I be using special boxes and bags, but that there just might, somewhere in my town, be a specialty store that would sell me such things (there was!). It was the first I’d ever heard of such arcane topics as grading comics, or terms like “Silver Age.” I can’t be the only kid from this time who became a lifelong collector in part because of this issue. I was a little disappointed that, when it was collected in the Roger Stern omnibus, the guide pages weren’t included. Best post of 2019! Thanks Mike! King of the Moon – Hmmm…I wouldn’t trust that guy. Joseph – Yeah, I poked a tiny bit of fun at it, but I can definitely see it as an education for folks new to the hobby! I am a huge fan of the early 80’s Bruce Jones / Brent Anderson ‘Ka-Zar the Savage’ series. Can’t say it’s worth anything though, but it’s a good read. So if you don’t like “Bronze Age” as a term, are there terms you do like? And do you think we need more “ages”? The current “modern age” has been (according to Wikipedia) going since 1985, and so is longer (34 years) than the silver (1956 – c. 1970) and bronze (c. 1970 – c. 1985) ages put together (30 years). If you were to create more “ages” what would they be and what would be the signifiers?